Nintendo has a rhythm that’s predictable when it comes to product releases: Create a new console, then create different iterations of those consoles with upgrades aimed at expanding market share in clever ways. The new Nintendo 2DS is no exception to that rule, but it is remarkable in that it’s a bit of a backtrack for the company, which takes the marquee feature out of its 3DS generation of portable gaming devices. It may be a backtrack on the surface, but the 2DS is an admirable step forward for Nintendo underneath it all. Nintendo’s design for the 2DS at first appears somewhat lazy and strange. They’ve taken the trademark two screens of the traditional clamshell DS and 3DS hardware and simply stacked them one on top of the other vertically on a single plane. It’s like a 3DS without a hinge in the middle, and without seeing or touching the thing, I was expecting something unwieldy and awkward. What I actually found was that the Nintendo 2DS is cleverly designed, and fits nicely in the hands. It’s highly plastic design doesn’t feel necessarily all that refined, and my 3DS XL definitely comes off as a more “premium” device, but the 2DS feels durable and well-built. It feels, in fact, like the kind of gadget you can probably spill some Kraft Dinner on without much adverse effect, which I suspect is exactly the point. The hand positioning in terms of the controls fit my grip perfectly, but your mileage may vary. And it’s not all roses: the lack of a Wi-Fi physical toggle seems somewhat arbitrary given the rather thick bezel on the side of the device. But the sleep switch ensures you wont’ burn through battery too quickly in the absence of a clamshell sleep trigger, and the light/durable feeling of the overall package makes it seem like an ideal choice for rugrats who might not be completely neat, or for travellers who just want something they can throw in the duffel on the way out the door. The 2DS performs like its more expensive predecessor, in most respects except for the absence of a 3D display. That’s where the perceived backslide comes into play; Nintendo made much of the 3DS’ ability to provide glasses-free 3D visuals when it launched. Taking it out of the picture with the 2DS seems a pretty clear admission that the feature was little more than a gimmick. Regardless of what you think of Nintendo’s 3D efforts, you’d probably be hard-pressed to find an instance where you truly miss that feature on the 2DS. I have yet to wish it was there, and that’s the really impressive part about this hardware – Nintendo has been humble enough to scrap their marquee 3D for users who don’t need it, and offer up a significant dollar savings in exchange. It’s not the type of reverse-course move you’ll often see from big companies mid product cycle. The only other aspect of the 2DS’ performance that differs from Nintendo’s other handhelds is in terms of battery life. 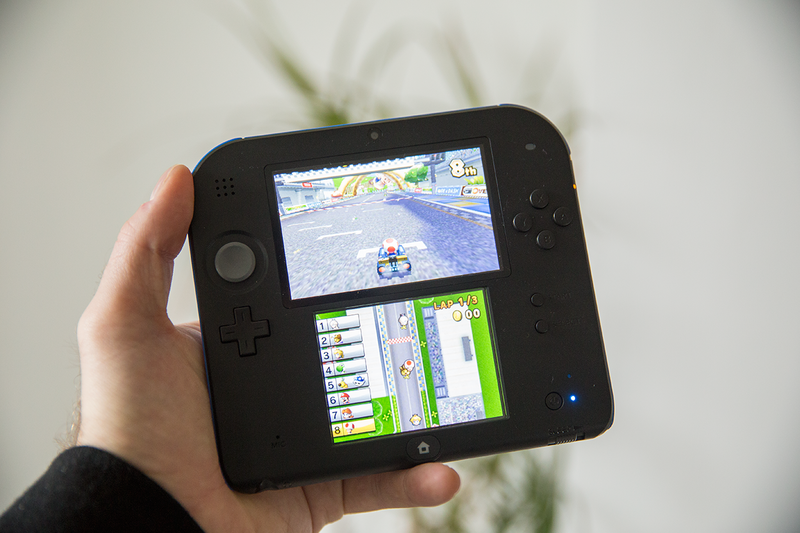 The 2DS is rated at 3.5 to 5.5 hours of play time on 3DS titles, or 5 to 9 hours for DS games. That’s just slightly better than the 3DS, and just slightly worse than the 3DS XL. In a world where people are used to 8 to 10 hours of play time on iOS and Android tablets, those figures aren’t great, but in practice, and given the three days of standby energy time, it actually doesn’t feel inadequate. The 2DS doesn’t have 3D, as mentioned above, but its displays are worth drawing attention to if only to note that they’re the same as the ones in the 3DS in all other respects. The lack of 3D will be a feature to some, as it does seem to minimize somewhat any annoying visual artifacts left by the physical changes needed to make 3D possible on a display without glasses. And so long as your eyesight is good, the 2DS has better pixel density and therefore sharper resolution than the big-screened 3DS XL. Does that mean they 2DS screens are great? No, and the low resolution relative to today’s modern smartphones and tablets is really beginning to show. Plus, that bottom touchscreen is still resistive, which means that even though it’s tempting to want to tap buttons with your fingers, especially in settings menus, you’ll still need to break out that stylus to get good, consistent results in terms of registering taps. The 2DS plays all the games I want it to play, costs a decent amount less than a 3DS, does away with needless 3D, and despite weighing slightly more, actually feels like a more durable travel companion (fewer moving parts definitely helps with that). It’d be nice if they’d left out the 3D cameras on the back and included a hardware Wi-Fi toggle, but that’s splitting hairs – the 2DS is, ultimately, a clever re-imagining of Nintendo’s current generation mobile hardware that should convince casual fans and fence-sitters it’s finally time to take the plunge.